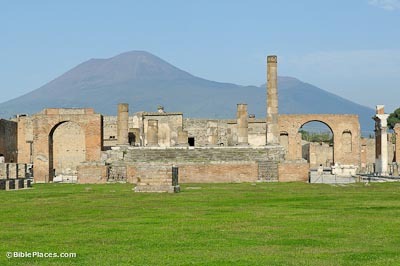 Likely founded in the 6th century BC, Pompeii became a Roman city in 80 BC. 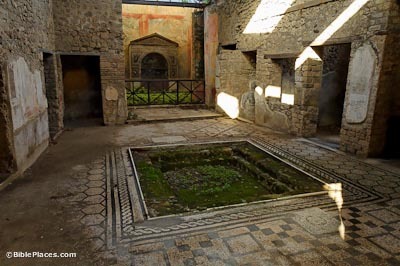 In the first century AD, it served as a resort town for wealthy Romans, as exemplified by the city’s mosaics, murals, gardens, fountains, and private baths. All this changed in the year AD 79, when a volcanic eruption covered the city of Pompeii with ash and hot mud, leaving it buried for excavators to re-discover in the 18th century. Scholars disagree over the population of Pompeii at the time that it was destroyed, with estimates ranging from 12,000 to 30,000 inhabitants. The eruption of Mount Vesuvius on August 24, AD 79, which buried the c cities of Pompeii and Herculaneum, was witnessed and recorded by Pliny the Younger (AD 62-112). Pliny was later a Roman senator and the nephew of Pliny the Elder. In two letters to his friend Tacitus, the famous historian, Pliny the Younger recorded in vivid detail how his uncle, admiral of a Roman fleet stationed at Misenum, was killed by the smoke and ash. Pliny the Younger was 17 years old at the time. He observed the event from Misenum, at the northwestern tip of the Bay of Naples. Mount Vesuvius is the only active volcano on mainland Europe and last erupted in 1944. 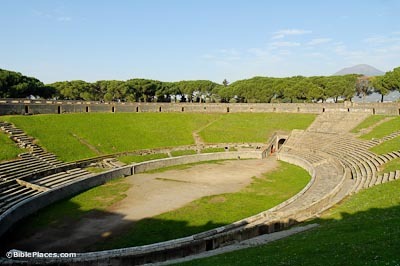 Built before the Colosseum of Rome, this amphitheater (80 BC) is one of the oldest and best preserved in the world. It could accommodate 10,000 spectators. 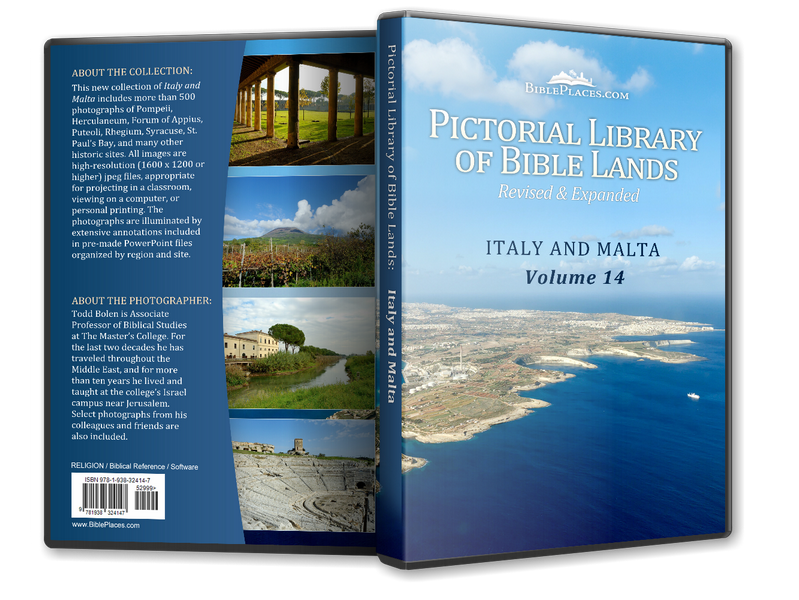 This was the site of a famous riot in AD 59, which ensued between Pompeii and the nearby city of Nuceria during a gladiatorial show. Because of the number of deaths from the riot, the Senate prohibited any games to be held in the amphitheater for the next decade. 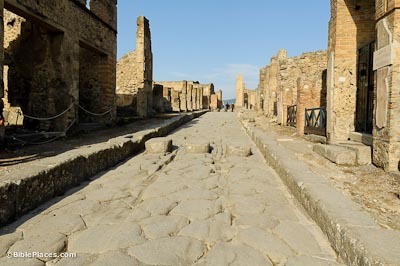 The streets of Pompeii were composed of large, polygon-shaped volcanic rocks. The centers of the streets were raised so that runoff would drain into the side gutters. There was, however, no drainage system for the gutters, and thus filth would accumulate in the streets. “Crosswalks” were constructed of raised stones that allowed pedestrians to cross the street without stepping in the dirt and mire. The spaces between the stones allowed wheeled carts to pass. Pompeii was laid out in a grid of insulae, or blocks, with parallel streets intersecting at right angles. Each insula was walled in and most contained a mixture of dwellings, shops, and restaurants. 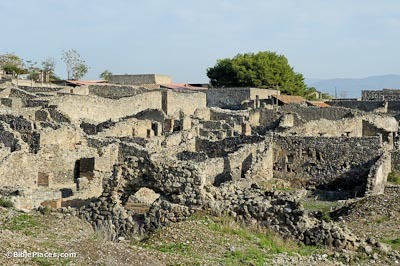 Pompeii was not divided by income classes, and the homes of the wealthy can be found alongside those of the poor. The atrium house was the most common style of house. 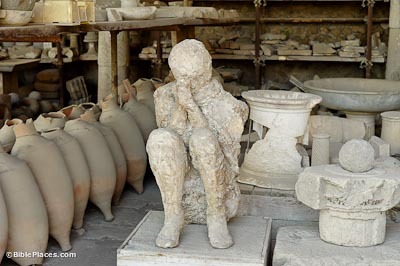 Though many people fled from the erupting Vesuvius, some inhabitants of Pompeii either were unable to escape or chose to remain. Their bodies were sealed by ash and pumice. When the bodies later decomposed, they left behind cavities with impressions which preserve the minutest details of the bodies. The cavities are essentially molds, and archaeologists were able to devise a method for creating casts of the bodies by pumping plaster into the cavity.